I can't stress enough how awesome this cream is! This is a miracle product! I have only used this for a month+ and the result it gives are truly amazing!! Look at that! Omg, how it helped to clear up those monster zits! It's 'slime-y'(like real snail slime/mucin) and sticky gel-like texture but no worry, it's not sticky after it absorbs into the skin. It's a non-greasy lightweight cream and it's not heavy at all. As you can see from the pictures, the cream is in white color which absorbs into the skin without leaving a white cast/layer on the skin. It's fragrance-free! However, it does have a faint smell which I don't really know how to express...smell like a pure, raw and natural snail extract cream without adding in fragrance(?) [... ... ...] I don't know what I'm talking about... Orz [...] lol. It does not have a strong or bad smell anyway. 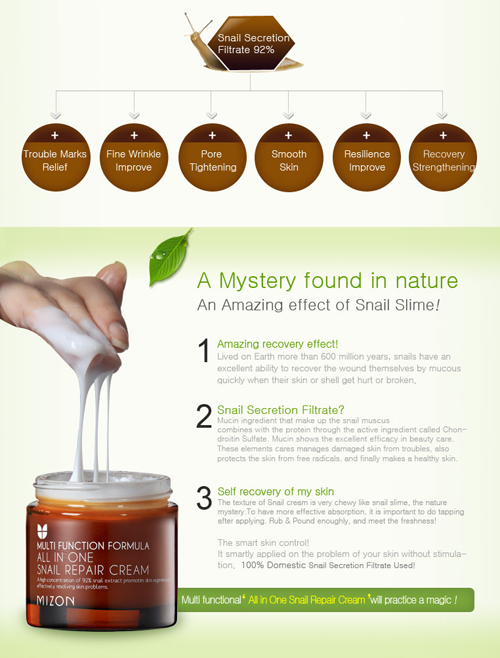 - contain 92% of snail secretion fitrate! 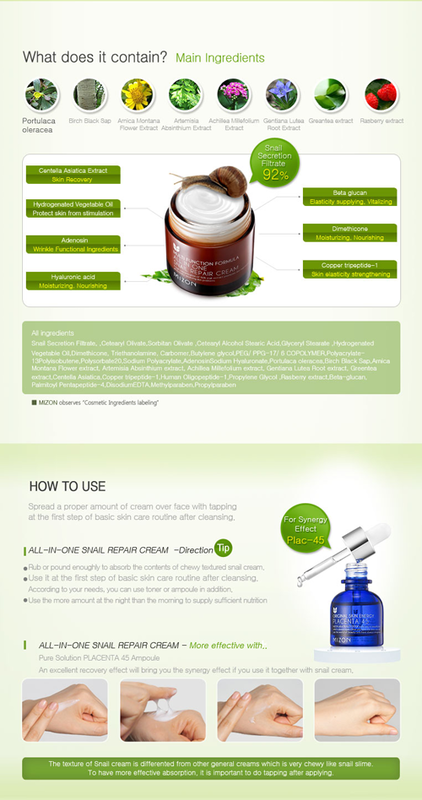 - lightweight cream. it's not heavy at all! - speed up acnes and hyperpigmentation/scars healing! - lighten and get rid of redness. - not sticky nor greasy! - absorbed into the skin fast! - suits all skin type including sensitive skin! - not very moisturizing... I do use a hydrating moisturizer after using this. - comes without a spatula! TSK! As I have mentioned before, I hate dipping my fingers in to dip out the cream! TSK TSK! That being said, keep in mind that...Anytime you start using a new product, do use it for a month before you make the final conclusion. Your skin needs time(est. 2-4 weeks) to get adapt to new products, routines or regimen. Don't expect drastic changes overnight. On a side note, remember to do a small patch test before slapping the cream onto your face especially if you are using some other brand products in the same routine. I suffered from a skin reaction when I used this with Etude House AC Clinic Red Spot Balm and so I concluded both products can't be use in the same routine probably because of the ingredients. eg: Ingredient A + Ingredient B = Skin Reaction...? lol. do you think its advisable to use this with hada labo SHA lotion? I also used it about a year ago, it's amazing. 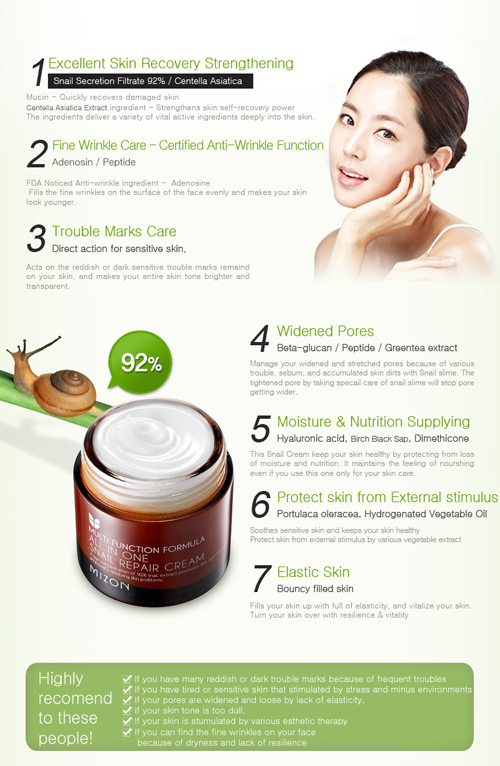 I also will try this cream after i finish my missha cell renew snail cream.. can't wait.. 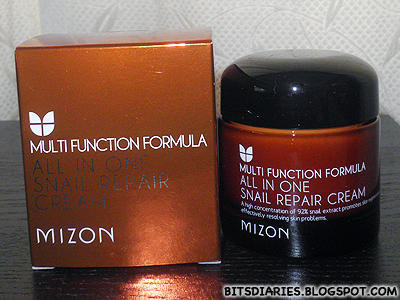 I bought some, so if you from indonesia and want to buy this mizon all in one snail cream. I have it in my stock. May i know where to buy this from? I got it from Qoo10(Gmarket). i have a lots of scars on my legs, can i use this cream? 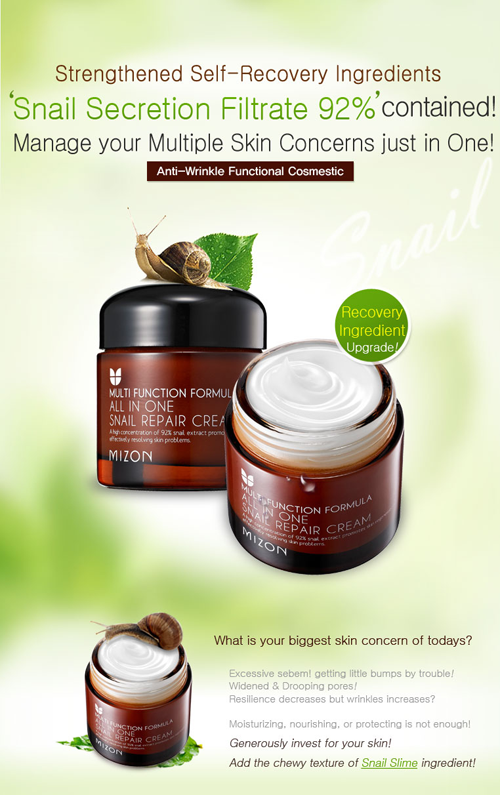 between Hiruscar Gel and this Snail Cream, which one you think is better for post-acne scars? I got some sort of red itchy patches. 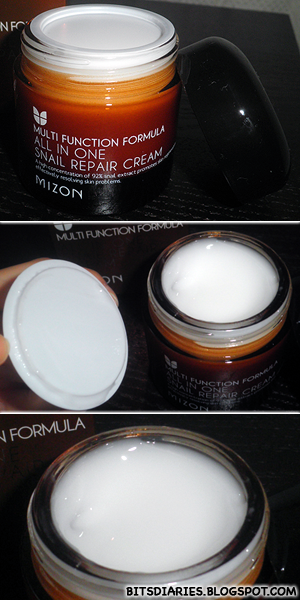 I did get mild purging when I started using this mizon cream and it lasted for about 2-3 weeks. I'm not sure if what I went through was similar to yours... but if it's still causing you to breakout badly, stop using it. hi! i just purchased this mizon all in one cream and i get mild breakout around my tzone and my forehead. i dont know if it's purging or a sign that this cream is not work out to my skin. do you also feel that itchiness when u were using wash off mask? Can a 16yr old use this?thanx!